Carte de l'Assyrie Pour servir a l'Histoire des trois Monarchiea de Ninive, de Babylone et d'Ecbatane. 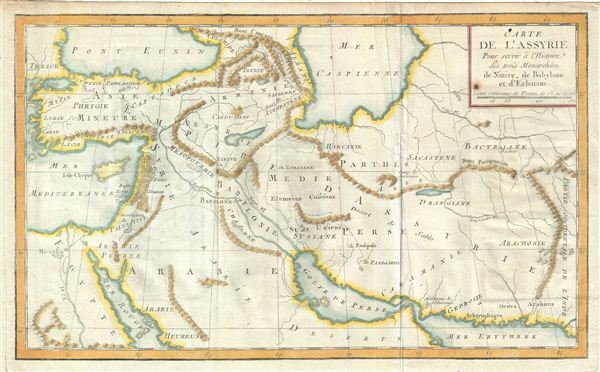 This is a beautiful example of the 1770 Jean-Baptiste-Claude Delisle de Sales' map of ancient Assyria. Essentially a map of the entire Middle East and Persia, this map covers from the Black Sea to the Gulf of Oman and from the Mediterranean Sea east as far as the western part of India. This area includes the modern day countries of Iraq, Turkey, Syria, Lebanon, Armenia, Azerbaijan, Iran, Israel, and part of Saudi Arabia and Egypt. The map was drawn to illustrate the history of the three Assyrian monarchies of Nineveh, Babylon and Ecbatana. Several important towns, rivers, mountains and other topographical elements are beautifully rendered. This map was issued as part of Delisle de Sales' Histoire des hommes. Partie de l'Histoire Ancienne. Becasue most of Sales' work was burnt under the censorship of heresy, this volume is exceedingly rare.